Today in New York City the US Navy officially commissioned the USS Michael Murphy which is named for Navy SEAL, Michael Murphy who lost his life in Afghanistan while trying to save the lives of the other members of his SEAL team. 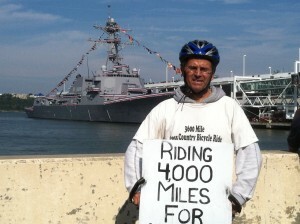 This was an event I did not want to miss so I headed on The Kindness Bicycle to the New York Harbor for the ceremony. The event was more joyful than solemn, as the Lieutenant’s life was celebrated by his parents, family, friends and dignitaries, including Secretary of the Navy Ray Mabus. As The Kindness Bicycle Ride for Heroes is about to begin its final week, I am reminded of all the Heroes I have met across the United States during this 9 month tribute ride. It has been a true honor. This entry was posted on Saturday, October 6th, 2012 at 10:10 am	and is filed under Kindness. You can follow any responses to this entry through the RSS 2.0 feed. You can leave a response, or trackback from your own site.